Jordi Pérez is a barber from birth. He was born in the heart of the family that owns the Peluquería de Caballeros Biada, a family business founded in 1964, which since its beginnings marked a protocol that still stands today: quality in all aspects and a mixture of traditional and advanced techniques. Past and present by the hand from the first day. La Barberia de Gràcia is a business exclusively aimed at the male public, one of the few that still offers a shave with traditional technique of razor and hot towels. In 2001 Jordi Pérez takes up the baton from his father and becomes the new owner. He begins his own personal project. 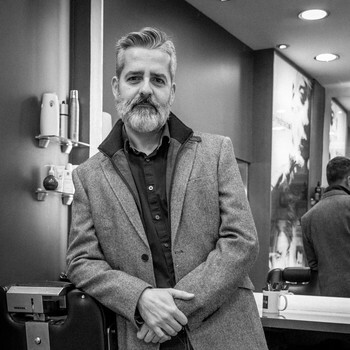 The second change was in 2014, when Jordi relocated the salon and finally creates his dreamed project, where his vocation barber meets his business vision. A place where classic blend with innovation. Always with a final goal: to offer a pleasurable experience, what he has named as "barber wellness". Today La Barberia de Gràcia is the only barber shop in Spain with the quality badge offered by QHair ***, a recognition similar to Michelin Stars in restaurant business. Jordi Pérez exercises as a trainer, giving sessions about his shaving ritual that every day enjoy more and more demand, sessions that attract professionals even from abroad. Jordi Pérez, in response to his creative concern, proposes and presents his own collections. "Back to The Barber", "One Step Beyond", "Dirty Face" and “Grey Fringes”. All the work done by Jordi has received its fruits, receiving the prize "Despuntan" (2013) and the "Hairdresser Revelation 2014" prize, in addition to being a finalist in all editions of the "BarberiasConEncanto" Awards and winner in Second edition in the category of Best Barber and finalist at Premios Figaro in Best Man Collection with “Dirty Face”. In this 2017 Jordi has been finalist in the Men category at International Visionary Awards, and also finalist in Best Concept Salon at Premios Look.